Strategy games can be deeply satisfying if they’re developed correctly, especially if you love the intensity of a good challenge. Tower defense games are some of the best strategy type games around, and in most cases they don’t take a whole lot to be decent. As long as they can be somewhat tough and give you freedom to mix and match the towers you like and they aren’t extremely easy, they can be fun. This isn’t exactly the case with this week’s pick for game of the week, but it is a great deal of fun and should be given a shot. Not to mention the visuals here are probably the best I’ve seen from any tower defense game, or very close to it. The only issue I have with Epic War TD 2 is that it seems there is a specific set way you have to beat each consecutive wave sequence. There isn’t really enough freedom to place the kind of towers you want, as you’ll usually end up failing if you don’t use a specific type of tower for certain scenarios. It almost feels like hand holding. Mind you, I am only on the 7th or 8th wave mission of the first chapter, and there are about 9 or 10 missions per chapter with six chapters, so this could very well change going into the second chapter and moving forward. Other than that one detail, Epic War TD 2 is a great game. 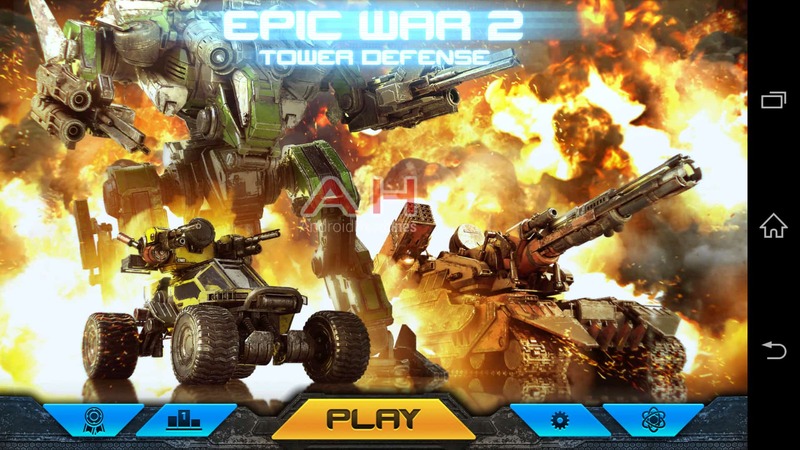 As far as Tower Defense genre titles go, this has plenty to offer. You’ll find that your towers are comprised of highly advanced weaponry to take on the waves of infantry, bots, tanks, and other manner of mobs you’ll need to keep from getting past a checkpoint. Each mission will have three waves in which you need to stick it out through in order to complete that wave, and in each wave there are usually three to four sub-waves of enemies. You’ll get stars for completing missions with which you can buy your new towers as well as unlock their upgrade capability. There are 9 total high power towers, 4 mega towers, 44 unique enemy types, and according to the devs, 100+ hours of content across 50 puzzling missions. The game is only $2.99 right now but that price is also listed as 40% off as a special launch sale price, so if you’re interested I would recommend picking it up asap.